So I’ve recently taken an interest in canning. And when you 1st start out, Jams and Jellies are the way to go. So far I’ve been able to can a Triple Berry Jam and a Peach Jam… so Beer Jelly is the next logical step. Well, at least for me it is! 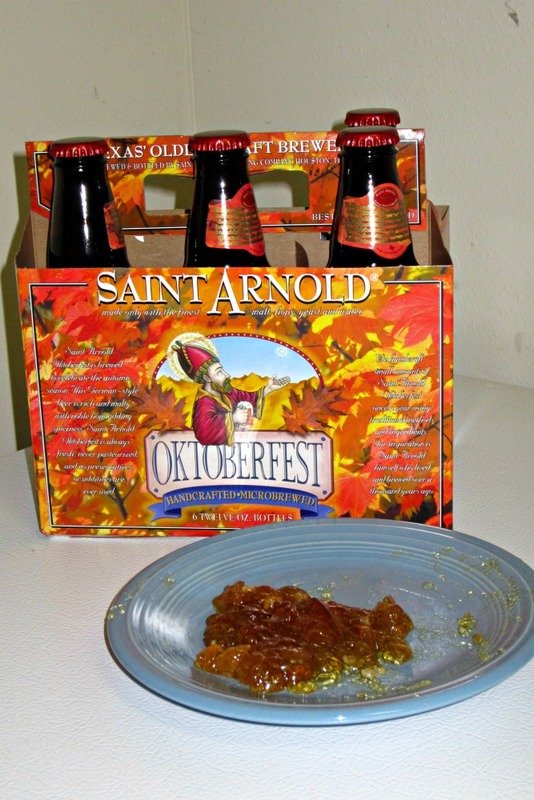 I decided to use one of my favorite Seasonal Beers, Saint Arnold Oktoberfest, for the experiment. 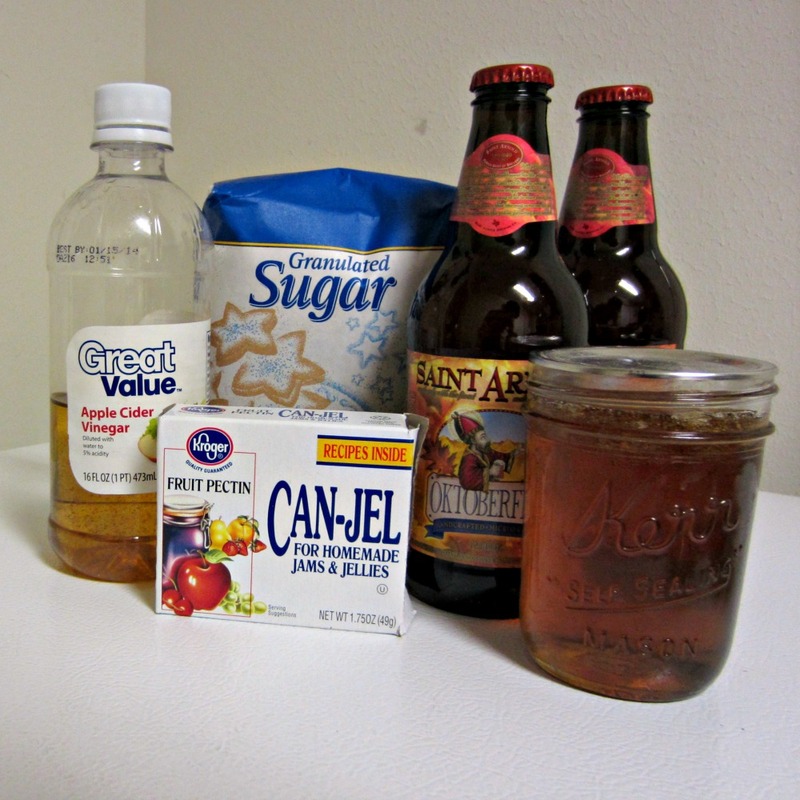 After scouring the Internet, I couldn’t really find an “official recipe.” Beer Jelly is not too traditional. But I did come across a lot of helpful tips. Like “Use flat beer” and “Use a BIG pot.” I was also reminded to add some acid so the jelly would set and not just make a thick syrup. I decided to use apple cider vinegar (because apples remind me of Fall). I poured 2 bottles of beer in a pitcher and left it in the fridge over night. This seemingly flat beer still boiled up like CRAZY… something that I am sure home brewers are accustomed to. But after the hard boil and some stirring, I was able to reduce almost all of the foam away. The remaining jelly-foam was skimmed off and put in a tupperware for me to enjoy later! Sadly, in my haste to get the jars in the canner pot (aka the stock pot usually just used for spaghetti), I don’t think I screwed all of the rings on tight enough. I should have burnt my hands just a little to make sure the were all on tight. Oh dear. The waterbath looks a little like one may have leaked a bit. But looking at the jars, I cannot tell which one did. Also, even after the jars came out of the waterbath, a couple still looked like they were releasing carbonation bubbles. Is that right? I don’t know. There are no hard and fast Beer Jelly rules. I need to wait 24 hrs to see if the jars will stay sealed properly. At any rate, I don’t know if I’d give a jar to anyone as a gift… unless they are prepared for it to be a prototype/beta version of what I think could be something really great. LUCKILY there was enough extra jelly at the bottom of the pot to taste test! Paula Deen used to say “The profits are in the corners.” Taking a heatproof spatula and scraping the sides of the pot (and the ladle) actually turned up quite a bit of jelly. Not enough for a whole jar, but enough to save in the fridge for later! I had several samples. Verdict: The jelly is sweet, and still tastes like beer. Totally edible! I bet it would go great with pretzels, or as a glaze for chicken wings. And I am fairly certain all of the alcohol didn’t burn off. An adults only snack? Be warned, making Jam and Jelly makes a stick mess all over your kitchen. But, I think it’s all worth it. Follow traditional jelly making instructions. Process in waterbath for 10 minutes. Darcie gave me some good Beer Jelly Advice via Facebook.